Portsmouth defender Arjan de Zeeuw has accused El-Hadji Diouf of spitting at him during Pompey's match with Bolton. 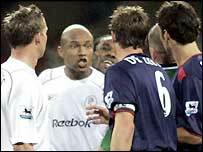 Diouf appeared to spit at De Zeeuw during the second-half of the match at the Reebok Stadium. "I felt it in my face. Hopefully it was just heat of the moment stuff because it's not very sporting," said De Zeeuw. Diouf was fined for spitting at a Celtic fan while a Liverpool player and is the subject of a police probe over claims he spat at Middlesbrough fans. De Zeeuw added: "There was a lot riding on the result and we knew what we had to do. "I had a word with the referee at the end of the match and I tried to with El-Hadji Diouf. "The team is still the same (as when Harry Redknapp was here) and this win has been coming for a long time. We will take it from here."